The popular press has again focused some of its attention on animal-assisted therapy and animals being welcomed to workplaces and other public venues. A September 6 article in the New York Times, by Jennifer Kingson “As Animal-Assisted Therapy Thrives, Enter the Cats,” is one recent article that dis­cusses animals intentionally brought to workplaces and other “unconven­tional” locations. Kingson reports that “Evidence of the growing enthusiasm for therapy animals is cropping up in health and academic circles. The American Hospital Association held a webinar in July on how to set up or improve a hospital animal program. Aetna, the major health care company, is among the growing number of employers that bring therapy animals into the work­place to reduce stress and lift people’s moods.” Kingson also shares that dogs are the animals that most often support people outside the home, but that cats, rabbits and even more “exotic” animals such as miniature horses and llamas are occasionally also used to enhance wellbeing away from home. As more pets and other companion-type animals are finding themselves in workplaces, it makes sense to plan for their presence. 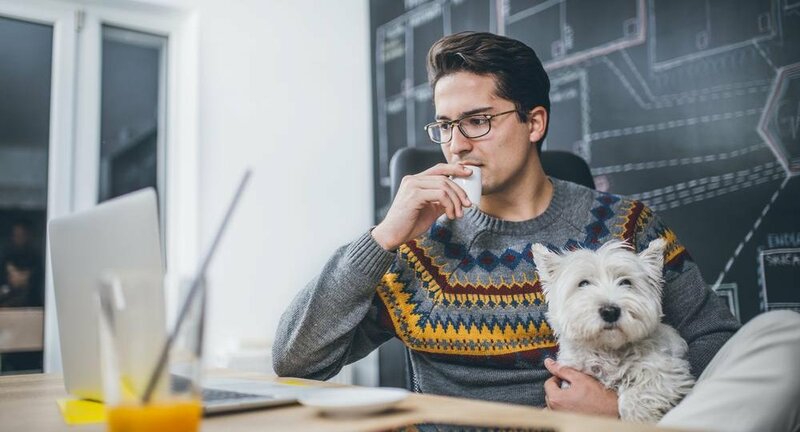 Every area in every office doesn’t need to be completely pet-friendly, but enough spaces should be so that work can go on basically as usual when pets and companion-type animals are present. Considering animals that might be intentionally present when workplaces are designed doesn’t necessarily change much about the way offices are designed. Easy clean surfaces, for example, may be desirable in an area regardless of whether puppies might be there or not. Similarly, green outdoor areas around workplaces are good for worker mental health, regard­less of whether dogs will be or won’t be walked in them. Animal proofing a space and sup­porting animal amusement are prob­ably additions to the workplace design brief – but they don’t need to dramati­cally affect office form. Windows are plentiful in many workplaces; slightly tweaking their form can make them more animal-friendly. Dogs can enjoy looking out windows and windows that reach all the way to the ground enable even big dogs to do so, for example. Another example: even the best-be­haved dogs are sometimes tempted by food left “unguarded,” say on an open shelf at nose height above the floor. Doors on the front of places where food will be kept help keep at-office visual complexity at comfortable levels and may help reduce vermin’s access to whatever is being stored, just as it can keep puppy noses away. Similarly, cats love to climb but not necessarily to retrace their steps and return to the ground. It’s probably prudent to con­sider how “elevated” cat rescues could be conducted in an area with some­thing that will tempt a cat upward if there is much likelihood that a cat will spend time in a workplace. Office design that supports human well-being probably generally sup­ports animal wellbeing also – but it can’t hurt to consider how a dog or a cat will experience a work area when one is being developed, particularly as the number of animals intention­ally present in workplaces continues to increase. “New Research Shows Why the Commute Should Be Counted as Part of the Working Day.” 2018. Press release, University of the West of England. Sally Augustin, Ph.D., a cognitive sci­entist, is the editor of Research Design Connections (www.researchdesigncon­nections.com), a monthly subscription newsletter and free daily blog, where recent and classic research in the social, design and physical sciences that can inform designers’ work are presented in straightforward language. Readers learn about the latest re­search findings immediately, before they’re available elsewhere. Sally, who is a Fellow of the American Psychologi­cal Association, is also the author of Place Advantage: Applied Psychology for Interior Architecture (Wiley, 2009) and, with Cindy Coleman, The Design­er’s Guide to Doing Research: Applying Knowledge to Inform Design (Wiley, 2012). She is a principal at Design With Science (www.designwithscience. com) and can be reached at sallyaugustin@designwithscience.com.